The season of highway construction and maintenance will soon be upon us. With fines doubled for traffic violations in construction zones, it is important to know how to stay safe and avoid a ticket. When driving in a construction or road maintenance zone, be sure to yield the right of way to work vehicles and maintenance and construction workers. Outside construction and maintenance zones, vehicles that are obviously working on the road, with their lights flashing, also have the right of way. Stay safe and avoid a ticket (with double fines in construction zones) and be sure to slow down in construction zones, and yield to workers and construction vehicles. RCW 46.61.215: Highway construction and maintenance. The driver of a vehicle shall yield the right-of-way to any authorized vehicle or pedestrian actually engaged in work upon a highway within any highway construction or maintenance area indicated by official traffic control devices. The driver of a vehicle shall yield the right-of-way to any authorized vehicle obviously and actually engaged in work upon a highway whenever such vehicle displays flashing lights meeting the requirements of RCW 46.37.300. 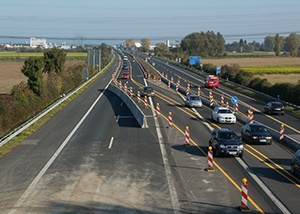 The additional distraction, confusion, and road closures associated with construction and road maintenance can easily lead to a car accident. If you are injured in an accident, you need an experienced and knowledgeable personal injury lawyer in Spokane on your side. The attorneys at Parke Gordon Law Firm will work hard to get you the compensation you deserve. Contact the law office of personal injury attorney Mat Parke today for a free consultation. This is your opportunity to speak with an experienced personal injury attorney about your case for free. Call (509) 482-7274 to get started on receiving a fair settlement from your personal injury case.